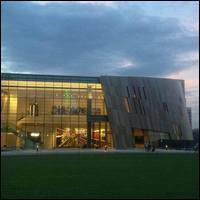 The Center for Civil and Human Rights is an engaging cultural attraction that connects the American Civil Rights Movement to today’s Global Human Rights Movements. The organization's purpose is to create a safe space for visitors to explore the fundamental rights of all human beings so that they leave inspired and empowered to join the ongoing dialogue about human rights in their communities. Parking: There is a parking deck located between World of Coca-Cola and the Georgia Aquarium that can be used by visitors for $10. MARTA: Take the Red or Gold Line to the Peachtree Center station. Head west on Andrew Young International Boulevard, and after three blocks, turn right on Centennial Olympic Park Drive. Turn left on Baker Street to reach the museum.